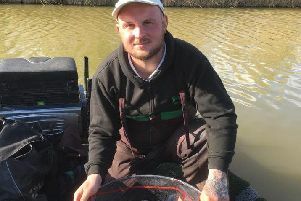 Deeping St James fished Horseshoe Lake at the Decoy complex for the third and final round of the Wade Cup with the Denis Clark Cup also up for grabs for the winner of this match. Match-winner was Antony Johnson on peg seven. He fished pellet shallow before switching to the margin for the last hour, fishing sweetcorn for a total weight of 144lb 4oz. Second was Chris Wheatley on peg 11 with 113lb 3oz, and third was Kevin Crompton on peg 17 with 101lb 7oz. The winner of the Wade Cup was Ray Torrington with a combined weight of 407lb over the three matches. The Ramsey AS Angling Trust Pike Qualifier at Exhibition Bridge was won by Derek Mansell with two pike weighing 8lb 12oz. Runner-up was Enzo Serino with one fish for 7lb 13oz, followed by John Freeman (one fish - 6lb). In just over a week Neil Bourne has experienced the highs and lows of match fishing. Last weekend he came second in a match, but his midweek match ended in near disaster. But on Sunday he came good again winning his first ever event. The match was a Webb’s AC event fished at North View Fishery where Bourne caught on a small feeder recording a modest 30lb 4oz for the win. Runner-up was Martin Parker on 26lb 4oz then came Gordon Harmer with 23lb 12oz. Rookery Waters regular Kevin Peacock won the Saturday Open on the Magpie Pool with a 162lb 14oz net of carp - his third win on the trot there. Runner-up was Vinny Easy, who caught on pellets for 139lb 10oz, with John Belshaw third on 116lb 14oz.